The case is a 6-in-1 lens kit for the iPhone X. 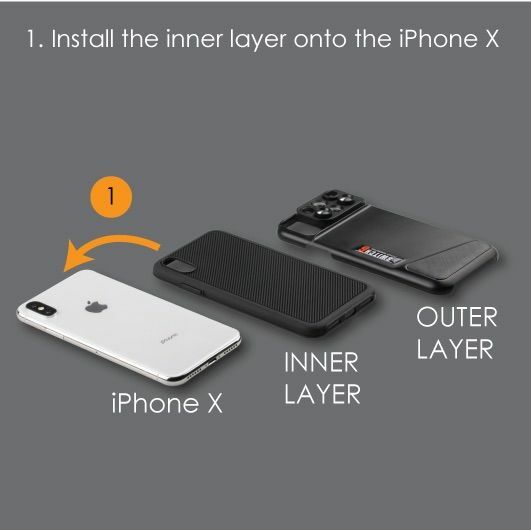 The dual-optics design of the lenses allow you to use it with the two cameras on the dual camera system on the iPhone X. Winner of the CES 2018 Innovation Award, the 6-in-1 lens design gives an extremely compact size that is full of functionality. The case's 6-in-1 lens design lets you quickly switch between the fisheye, wide angle, telephoto, and macro lenses. With the dual optics design, you have 3 sets of lenses that will work perfectly with the dual camera system on the iPhone X. The Switch 6 Kit is a low profile lens system designed and patent pending in the USA. Installation of the case and lens is easy! 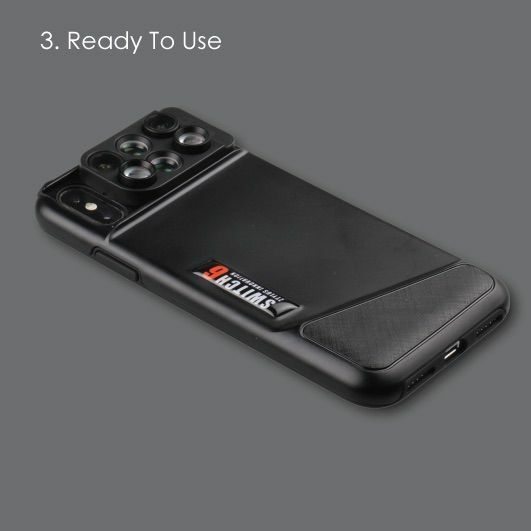 Just snap the case onto your phone and install the lens into the case. To change the lenses, just slide the lens up and you can be sure it’s always ready to capture the perfect shot. The Fisheye and Telephoto lens allows you to greatly extend your optical zoom range to capture a variety of shots. Use the Macro Lens to get extreme close-up detail. It is fully compatible with the dual camera system on the iPhone X. With a focusing distance of 18mm, get incredibly close to your subject until it comes into focus. Capture more and extend the range of your iPhone’s camera with the Wide Angle and Telephoto lens. Choose the lens that suits your needs. This case offers an all-around protection for bumps and scratches and the raised lip protects your screen when setting the phone face down. The cutouts allow for full functionality of all the ports and buttons. cool accessory, for those who like picture) recommend. nozzle for iphones earlier models have included. Très bon produit, de bonnes qualité, reçu en 8 jours ! Merci ! It was great to have this case with cool lens.. thanks so much seller! :-) god bless! More power.. recommended! it is one week, free shipping. стажем with big photographer. lens + 3 pair = iphonex порадовали bomb!!!! and обработал fast seller sent! three weeks come!! the very satisfied, cool did not expect so that it will be!!!! this camera case professional t in one!! three lenses parameters according to your pictures make excellent! elegant!! plus gift)) оооочень in order satisfied!! seller many thanks!!! recommend commodity!!! I find it very easy to use and extremely convenient.